I’m getting another western romance novel ready to go to the editor. (My tenth western romance.) I have one more proof read to go through before sending it to my editor. The other reason for being blog absent is because I haven’t had anything to say. I didn’t try hard to find something to write about, so this blog hop helps. 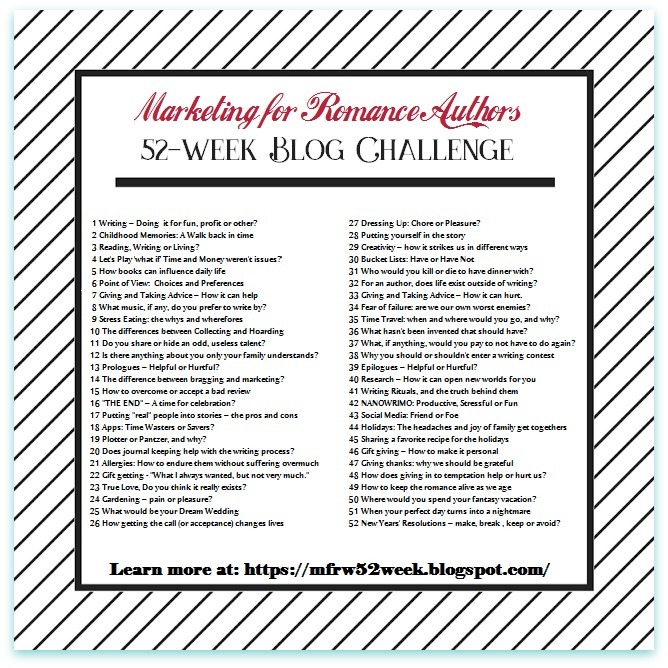 I didn’t want to have two weeks go by without contributing to the Marketing for Romance Writers Blog Challenge Blog Hop, so here I am at week thirty-two. I’m briefly writing about Ten Years from Now. Oh, boy. At this point in my life, I’m not sure I care to plan so far ahead. For one thing, I hope I’m alive, in decent health, and still have my eyesight. Oh, and that my back gets back to normal. It’d be nice if I lived near both of my boys, but the chance is slim. Very slim. One is already out of state, and the other will be in another state sooner than I want to think about. They’ll be on opposite coasts. If I can take turns spending time with them, and living independently in ten years, I’ll be happy. Of course, I hope the world is still here in ten years. As far as finally living my lifelong dream of being a full time writer, I hope in ten years I’ll be able to sit back and not have to worry about income, thanks to full-time writing now. If someone had told me ten years ago that I’d be doing this now, I wouldn’t have believed them, but it happened. Nonetheless, I DON’T want to be sitting at my computer writing one book after the other to ensure my financial stability when I’m ten years older. I DO want to sit at my computer and continue to write for pleasure at my own pace. Don’t get me wrong—I write for pleasure now, but I’m also building for whatever future I have remaining. What the heck will a computer look like in ten years? A book? I’ve been divorced. I’ve been widowed… Been loved. Been not-so-loved. Had best friends. Lost best friends. None of us know what’ll happen to us tomorrow…or an hour from now let alone to think of ten years down the road, but I’m thinking positively. YOUNG people should be planning for ten years from now. I repeat: Young people should be planning for ten years from now. Your future depends on what you do now. This doesn’t only mean to plan your financial future, but a healthy future too. Start planning. So there it is. I don’t have big dreams for ten years from now–like traveling the world, being on Dancing with the Stars, winning a Nobel Peace Prize, or being a grandmother, which would’ve happened by now and it hasn’t. 😦 Truly, I don’t often ask for much. In ten years, I want to live a life that is comfortable for me. How about you? Remember this is a blog hop with Marketing For Romance Writers. 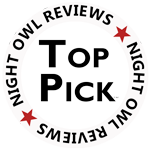 Please drop in on the other authors by clicking HERE. Pixabay gets credit for the “10” image and the computer image.